Great conversation about important topics for new parents and parents to be. Josie Long & Jonny Donahoe are two comedians who are having a baby! As new parents, Josie and Jonny bring their humor and genuine curiosity into each conversation to get actual answers to questions they’re completely clueless about. Each episode features creators of all types talking candidly about what it means to raise a baby into a full on adult human. How to you prepare for a test if you have no idea what the questions will be about? In this episode, Bridget Christie joins Josie & Jonny LIVE to talk about preparing for a child (and how it might actually be impossible to do so). This episode is sponsored by Care/of (www.takecareof.com code: JOSIEANDJOHNNY50), Pact (www.wearpact.com code: JOSIEANDJOHNNY), and BlueChew (www.bluechew.com code: JOSIEANDJOHNNY). Turning into a fantasy parent can be tempting but guest Philippa Perry talks about the importance of maintaining a sense of self in this episode. This episode is sponsored by Goodnight Stories for Rebel Girs (www.rebelgirls.co/podcast) and Pact (www.wearpact.com code: JOSIEANDJOHNNY). In this episode, we get into the politics of having a baby. From vaccines to surrogacy, guest Eugene Mirman offers perspective on some controversial issues. This episode is sponsored by Goodnight Stories for Rebel Girls the Podcast (www.rebelgirls.co/podcast), Pact (www.wearpact.com code: JOSIEANDJOHNNY), and BlueChew (www.bluechew.com code: JOSIEANDJOHNNY). The Mountain Goats song ‘San Bernadino’ is feeling quite relevant in Josie’s pregnancy, so it’s only right that guest John Darnielle joins to offer his best pieces of advice. This episode is sponsored by Goodnight Stories for Rebel Girls the Podcast (www.rebelgirls.co/podcast) and Pact (www.wearpact.com code: JOSIEANDJOHNNY). When Adjoa Andoh’s son revealed he was a “boy trapped in a girl’s body” she learned a lot, including how to accept your children for who they are— not what you thought they would be. This episode is sponsored by Goodnight Stories for Rebel Girls the Podcast (www.rebelgirls.co/podcast). What happens when your kids start asking profound questions that limit the depth of your knowledge? Nikesh Shukla joins to discuss this and more! Having a baby makes you wiser to the things your parents did. Guest Adam Buxton talks through how this parenting theory and others can cause you to have more understanding of parents in general. This episode is sponsored by Amaze.jr (www.amaze.org/jr/JJ), Care/of (www.takecareof.com code: JOSIEANDJOHNNY50), and Lola (www.mylola.com code: JOSIEANDJOHNNY). We talk baby names! What makes a great name? Or a terrible one? Guest Isy Suttie almost named her baby Josie...who knows what could have been!? In this episode, we discuss IVF and how to be helpful when you’re not the one who breastfeeding. Plus, guest Jen Brister talks being politically engaged despite the lack of time and sleep in parenthood. Postpartum Depression is something we don’t talk about enough. But what happens when mental health issues have always been a battle? Guest Jane Marie talks about this and other big picture topics like death. Single Motherhood is a whole different beast. This episode’s guest Rachel Sklar talks about the importance of self care and working hard while not feeling guilty. This episode is sponsored by Moshi Monsters (code: JJSLEEP) and The Real Real (www.therealreal.com code: REAL). In this episode we try to answer the hard questions about your Dad Persona, Santa Claus and how to avoid repeating the same mistakes your parents made with guest John Hodgman. This episode is sponsored by Moshi Monsters (code: JJSLEEP) and The RealReal (www.therealreal.com code: REAL). 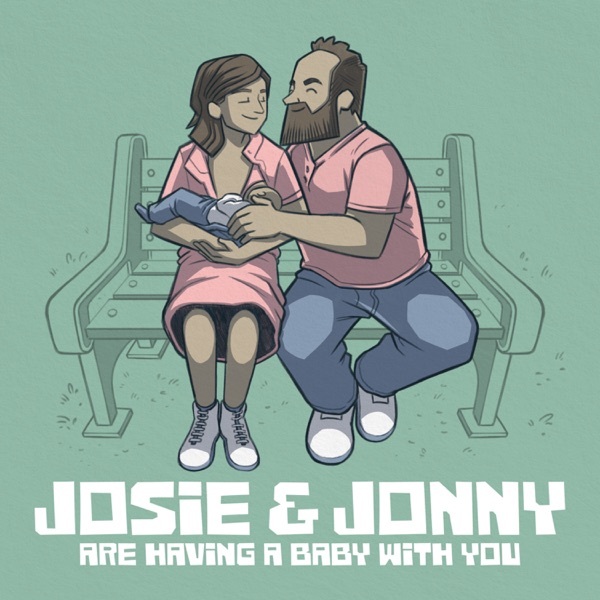 Josie & Jonny are Having a Baby...With You! Comedians Josie & Jonny are having a baby and they have no idea what they are doing! Luckily they have famous friends who can help them figure it out along the way.